The Bulldogs take on Southwest Baptist at home during the first-round of MIAA postseason tournament action. The Truman Women’s Basketball team continued their rise to the top by posting their first 20-win season since the 1998-99 campaign. The Bulldogs, under fifth-year Coach Michael Smith, won every game in Pershing Arena this year. They were ranked in the Division II Top 25 Poll for 11 weeks and at one point, led all of the nation in three-point shooting. The Bulldogs started the season winning 12 of their first 14 games. On Dec. 21, the team rewrote several school records in a 110-43 victory over Mount Mercy (Iowa) College. The team made 22 three-pointers and shot 71 percent from outside while freshman Courtney Strait made eight triples in the rout. 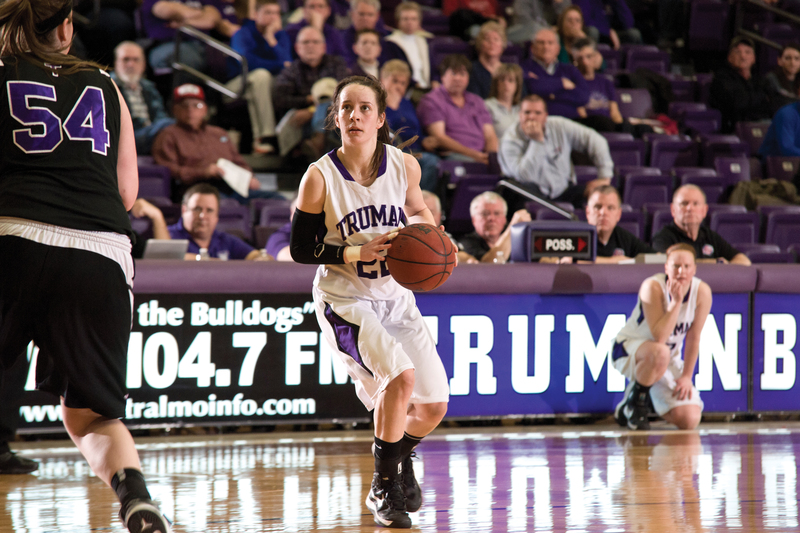 Truman edged out nationally-ranked Central Missouri 73-64 in Pershing Arena, and a week later before a large home crowd, rallied from seven points down in the final minutes to knock off Fort Hays (Kan.) State University 57-55 in double overtime. The team finished fifth in the regular season standings and hosted a first-round MIAA postseason tournament game. The Bulldogs defeated the Southwest Baptist (Mo.) University Bearcats 65-56 to extend their home winning streak to 15 games dating back to last season. In the second round game in Kansas City against Emporia (Kan.) State University, Truman fell behind by 12 but fought back to tie the game with just over two minutes left. The Lady Hornets would hold the Bulldogs to just three more points the rest of the way to win 61-56 to end the season. Senior guard Becka McHenry earned her second straight second-team all-conference honor after leading the team in scoring, rebounding and assists. McHenry became just the second Truman women’s basketball player to score over 1,100 career points, pull down over 500 rebounds and dish out over 350 assists. The only other player to accomplish that feat in Bulldog history was Amy Eagan. Sophomore guard Allie Norton was one of the nation’s top three-point shooters. At times, Norton led Division II during the season and finished with a school record 45.2 percent from beyond the arc. The previous record was held by Kathy Patterson in the 1990-91 season at 44.9 percent. Norton was an honorable-mention all-MIAA selection. The team, as a whole, shot a school record 41 percent from beyond the arc. They led all of Division II in three-point shooting and at several times during the season were leading all of NCAA Women’s Basketball from three.